Life with dementia is demanding. It has a lasting impact on caregivers that is undeniable. 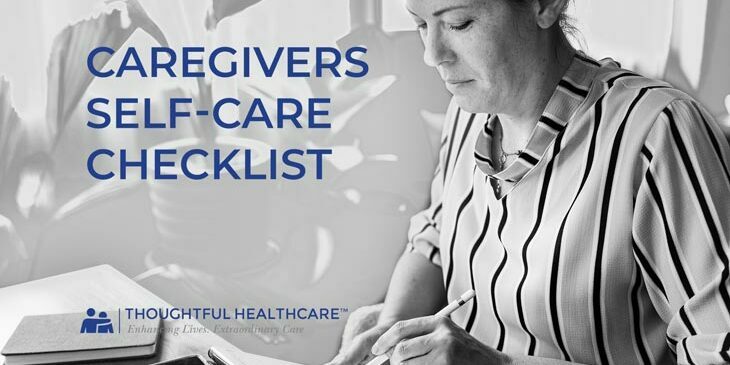 In the “Caregiver’s Self-Care Checklist” video, you’ll find helpful tips and ideas from Tim Tholen, CEO and Founder of Thoughtful Health Care and its affiliates in Kansas City. Nearly 40% of family caregivers of people with dementia suffer from depression compared to 5-17% of non-caregivers of similar ages. Kansas City Homecare and its affiliates are here to help you. We offer skilled in-home help for people who are elderly or have been diagnosed with dementia. Nevertheless, there are steps that caregivers should take to help themselves. Be sure to do serious self-care. Making yourself a priority is very important to your own wellbeing. Your health is your greatest wealth. Amp up your support network. People usually want to help—don’t be afraid to ask. Schedule something for yourself while your support network steps in. You’re worth it! Know that you do not have to do everything by yourself. Call our professionals at Thoughtful Healthcare for help. We are available 24/7, 365 days of the year. Spouses, children, neighbors, or friends can all be caregivers. They can live in Prairie Village, in Kansas City, in Leawood or in other Kansas City suburbs. They may be in their golden years or they may be parents of small children. Yet the one thing caregivers have in common is that they feel true effects of caring for someone with dementia. So take a moment for yourself, know that you are not alone, and take the time to care for yourself!